With its blooming branches and deep roots, this artistic rendition of the ancient symbol of heritage and knowledge is an exquisite tribute to families. A beautiful metaphor for all aspects of life, this statement piece will add a bohemian flair to your style. 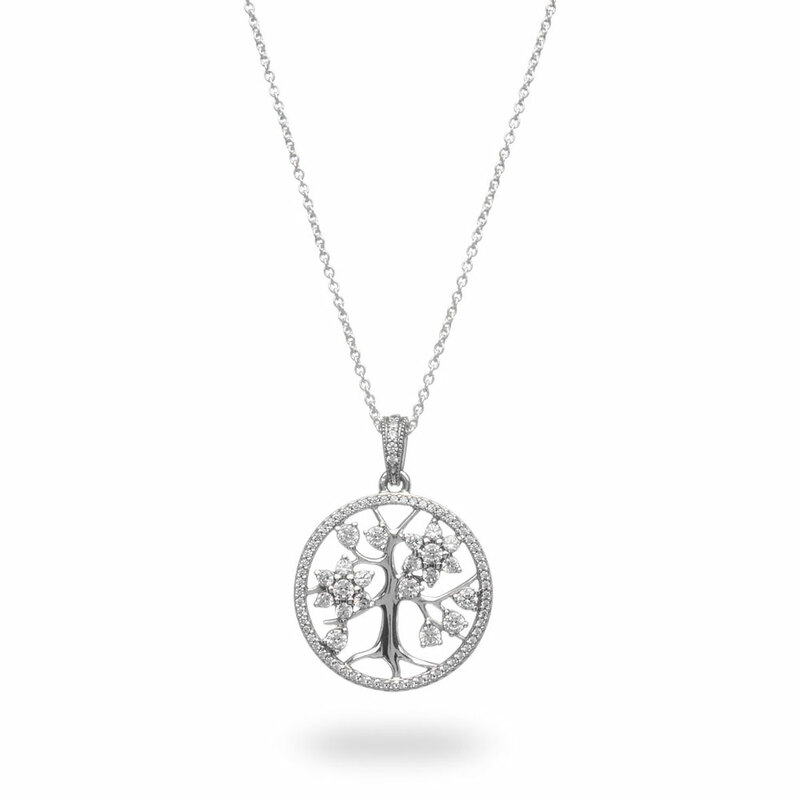 Family Tree Necklace with Pendant is rated 4.9 out of 5 by 27. Rated 5 out of 5 by Nikki71 from Beautiful pendant Bought this as a gift for my mom’s 65th Birthday present. Love it! Wish you all had put a card with the meaning of the pendant in with gift. Did it myself though. Thanks. Rated 5 out of 5 by Bxstepmom from Absolutely beautiful, a simple meaningful piece My step got this for me 2days who for Mothers Day and it’s such a beautiful piece that I can wear all the time and it’s look is classic. Rated 5 out of 5 by Loves jewelry and science from So much sparkle. Great stones. Love this piece. I’ve had this piece about a year. What sets it apart is the sparkle of the stones and the workmanship. It’s outstanding. I bought the matching tree of life charm for my bracelet and the charm can’t compare to the necklace in terms of beauty or sparkle. The long chain is very well made. A high quality piece with great detail. Rated 5 out of 5 by Jaz1 from my daughter loved it. purchased for my 27 year old daughter and she loves it. Rated 5 out of 5 by Cyndikk from Love this pendant! I saw this pendant on a coworker and ask her where she bought it, I loved it on her! The pendant did not disappoint, it’s beautiful!! Rated 5 out of 5 by suemacdoo from Perfect! I received this from my son for Christmas. It is absolutely beautiful and holds so many meanings! Love it! Rated 5 out of 5 by Smar from Mother's Day Gift I purchased this pendant for my mother in law for mother's day and she LOVED IT!! It was a great purchase and the pendant is absolutely beautiful. Rated 4 out of 5 by Bently from Birthday gift Sent this to my daughter who lives in another state. Love this item! However, since it was a gift, which I specified on the order it would have been nice if the item was placed in the gift bag and sent that way..not in a plastic bag, with the gift bag in another part of the box.